I'm not sure where I first came across it, I think probably on Twitter a few days ago. This morning I spotted it again with a lot more details, which really got me to look at it. 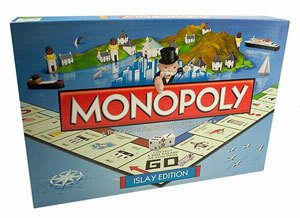 C & E Roy's The Celtic House in Bowmore is the driving force behind it, you can read an interview with the family on how they developed the game on the World of Monopoly website. I love the attention to detail with some really nice graphics and while they are not the first in Scotland it is easily the best looking of the ones I've seen.